Interstate 580 & U.S. 395 north at the Washoe Valley near Lake Washoe. Photo taken 10/05/12. Interstate 580 begins at U.S. 50 (William Street) in Carson City and extends north 31.930 miles to meet Interstate 80 in Reno. The route overlaps with U.S. 395 along the Carson City Bypass, the Washoe Lake Freeway, the Interstate 580 Freeway Extension over Galena Creek, and the Martin Luther King Jr. Memorial (North-South) Freeway in Reno. Until early October 2012, the Interstate-standard segments of Interstate 580 were signed solely as U.S. 395, with I-580 unmarked. Signs for Interstate 580 are not yet posted along the completed freeway south from U.S. 50 (William Street) to Fairview Drive in Carson City. This section is officially inventoried as IR 580 by NDOT, but signed as part of U.S. 50. The final 3.146 segment curving southwest from Fairview Drive to South Carson Street opened on August 2, 2017. Upon completion, I-580 measures 35.076 miles and was fully signed south of William Street (Exit 39). The Carson City Freeway was constructed in a multi phase project. Phase 1 upgraded existing U.S. 395 to freeway standards from East Lake Boulevard (Exit 44) in Washoe Valley to North Carson Street near Bonanza Road. A new terrain alignment was built from there east to U.S. 50 (William Street).6 The four mile segment of Phase 1 was completed on February 16, 2006. The section south from William Street to Fairview Drive (Exit 38) opened to traffic in September 2009. Work on the final link (Phase 2B-2) south to the junction of U.S. 50 and 395 near Indian Hills started in early 2013, with grading, storm water and utility work, and a new overpass built for Snyder Avenue. Phase 2B-2 construction was finished in summer 2014. 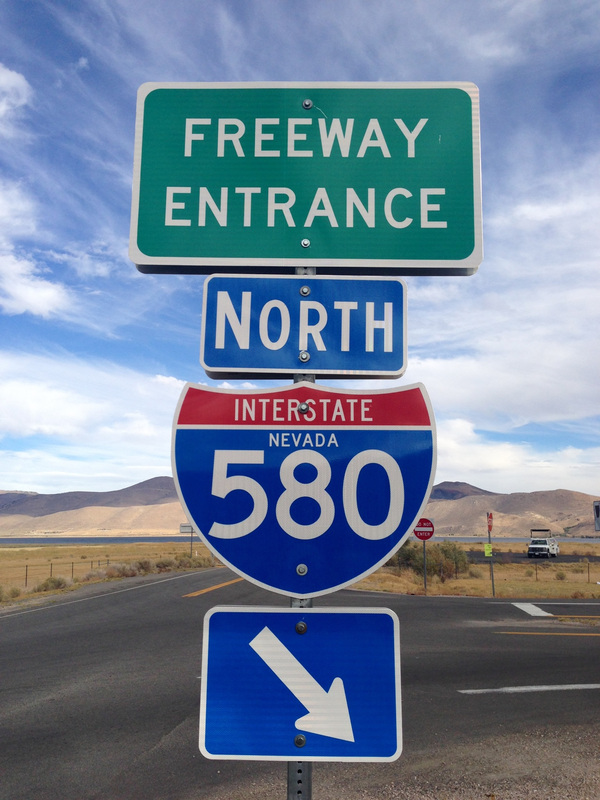 Interstate 580 was originally unmarked along the North-South Freeway through Reno, and signed instead as U.S. 395. The designation appeared on the 1982 Reno map published by the California State Automobile Association (CSAA). The map displayed I-580 along the U.S. 395 freeway between South Virginia Street and Interstate 80. Other maps showed Interstate 580 as a marked route for three or four years, including the 1985 Rand McNally map of Reno. Some signs for I-580 were posted in the field, including on approaches to U.S. 395 from intersecting roadways and on freeway entrance assemblies. Robert Herron further wrote on September 16, 2002 that guide signs displaying I-580 shields were greened out by the late 1980s, and that the rationale per a TV news story at the time was to reduce motorist confusion, since I-580 only ran south with U.S. 395 from Interstate 80. 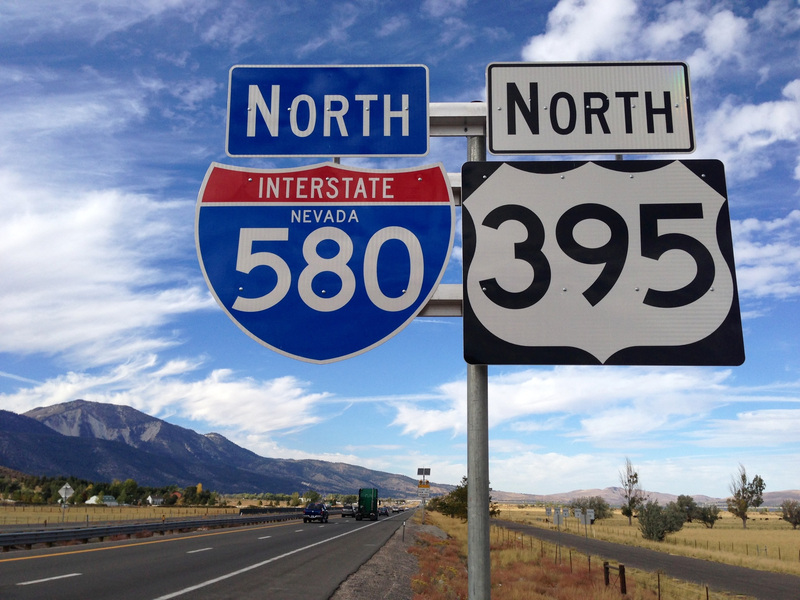 Ed Wilson, retired Nevada DOT Customer Services Representative, added that the "general public remains more comfortable with the &apos;395&apos; moniker. Actually the proper designation seems to be important only to the FHWA, NDOT, land use planners, a few highway buffs, and such. Mr. and Mrs. America seem to just get confused with all the different letters and numbers, so we try to keep life simple for them." "New I-580 Freeway Opening Date Announced." KOLO-TV Reno, August 14, 2012. "Gov. Brian Sandoval: I-580: The history -- and the promise by Governor Brian Sandoval." FOX-Reno News, August 14, 2012. "New I-580&apos;s name explained." NEWS 4 Reno KRNV-TV, August 7, 2012. "I-580 Or US 395?" KOLO-TV Reno, August 16, 2012. Nevada Department of Transportation : I-580 / U.S. 395, NDOT project web site.